The third in our Mission Tomorrow series: Cheteshwar Arvind Pujara. Discerning critics insist that Cheteshwar Arvind Pujara is probably the best thing that has happened to Indian cricket after Rahul Dravid. A cool, composed and compact batsman in the classical mould, the teen sensation from Saurashtra -- the region famous for producing the likes of K S Ranjitsinhji, K S Duleepsinhji, Amar Singh, L Ramji, Vinoo Mankad, Nyalchand Shah, Salim Durrani, Karsan Ghavri, Dilip Doshi, Dhiraj Parsana and Ajay Jadeja -- has already won plaudits from those whose comments count in Indian cricket. A very confident and determined batsman endowed with good footwork and an excellent repertoire of shots, Cheteshwar has scored heavily at every level of the game in course of a career that is still in its infancy. While it may be a bit too early to say for certain, there are people who are already projecting him as another Dravid. Born in Rajkot on January 25, 1988, the tall and well-built Cheteshwar was reared on a diet of cricket. In fact, cricket flows in his veins: his grandfather Shivlal Pujara represented the strong erstwhile state of Dhrangadhra, while his father Arvind and uncle Bipin played first-class cricket for Saurashtra with distinction. He honed his natural talent at the Railway ground in Rajkot under the watchful eye of his father, who has been serving the Indian Railway for years now. 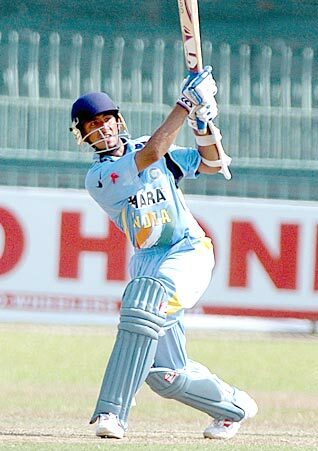 His mother Reena, who succumbed to cancer on October 6, 2005 while he was away playing a match in Bhavnagar, was always "a fount of inspiration" for him. Her dream was to see the youngster play for India, and increasingly it appears that the realisation of that dream is only a matter of time. Interestingly, Cheteshwar was a serious practitioner of leg spin bowling at the start of his career; he had the ability to turn the ball viciously with a curious, even peculiar, action. But he was so good with the willow that pretty soon, his father and other experts advised him to concentrate on batting as his most important skill-set. Today, Cheteshwar only rolls his arm over in the net, and very occasionally in actual matches to provide rest to a main bowler or to try and break a partnership. An alumnus of Rajkot's famous Virani School, which has produced many good cricketers including Ghavri, the embarrassingly quiet Cheteshwar first came in the limelight when he scored a monumental 306 not out (540m, 516b, 36x4), a national record, in Saurashtra's total of 460 for 5 declared in a West Zone Under-19 match against Baroda 2000-01.